Root touch up sprays are one of those things that I wish I had known about forever. I started going grey (like everyone in my family) around 19 or 20 years old. But I didn’t know about root sprays so I would either just have roots or touch up my hair every 3 or 4 weeks. I only had a few grey hairs scattered on my head and was a bleach blonde for about 8 years so it was easier to get away with the greys. Now I am 99% grey so THE GAME HAS CHANGED, KIDS. I get a stripe about two weeks after coloring that just looks like I have a bald strip down my head. So root touch up sprays are now my hair saver. I wonder how many people like me go grey so young? I need to look that up. I digress. 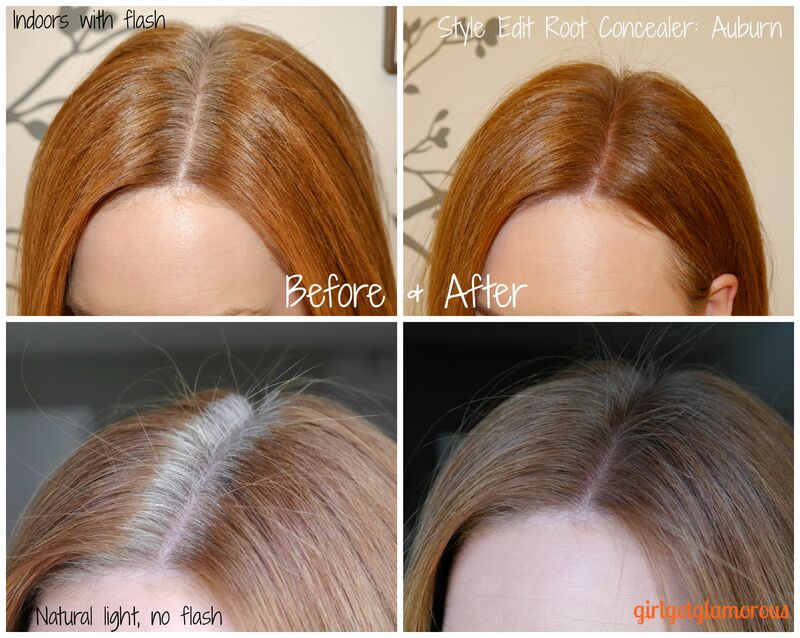 I found Rita Hazan’s root touch up spray at Sephora and loved it. It doesn’t bleed and is a natural shade of brighter red. It retails for $25 plus tax for a 2 oz can, which did feel pricey every time I had to repurchase. But being out thirty bucks felt way better than having 2 inches of grey roots. I wash my hair twice a week and use the root touch up spray around the sides of my temples and along my part. Then I spray my hair down and don’t touch it for three days. So a can would last me for a decent amount of time (approx 3 months, using it sparingly twice a week for the last 2-3 weeks before color touch up. What a mouthful that is, ha). I loved the Rita Hazan formula, but it did feel slightly tacky and was a bit too red for my color. It still felt better than a grey stripe, though, so I was in. 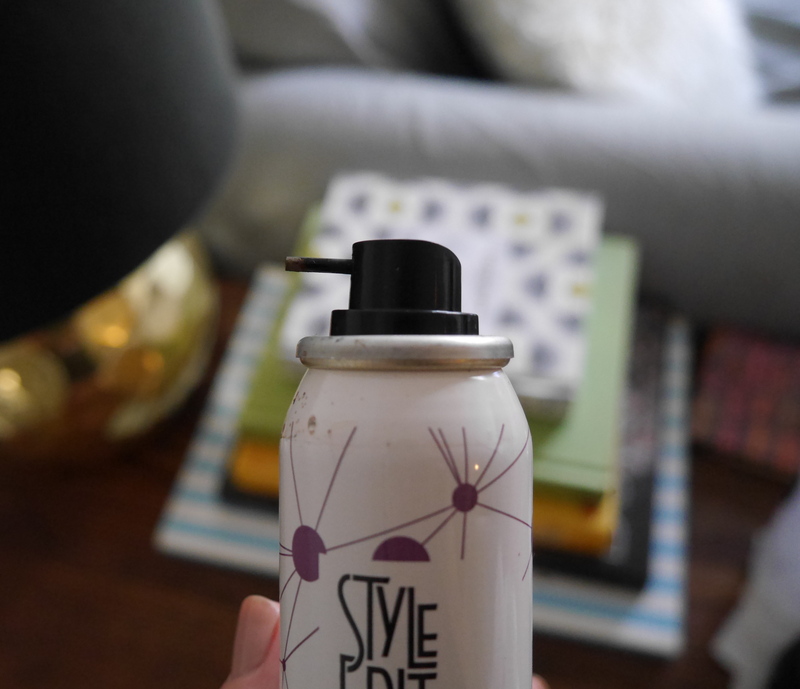 When I came across this Style Edit spray at the beauty supply store, I was intrigued. It’s where I buy my makeup for my professional kit and they always have some really awesome/unique products. I hadn’t heard of this brand before and honestly hadn’t looked that hard for an alternative to the Rita Hazan. The sales gal sprayed the Style Edit red shade and another brand (which I can’t remember the name of) onto a tissue. The Style Edit was SUCH a gorgeous, natural shade of red. It has hints of brown in it, which makes it much more wearable for us Strawberry Blondes. That hint of brown makes it look so much more like real color than a noticeable red cover up. Just like when I mix a bit of the Wella level 8 Golden Blonde with the 8 Titian Blonde for my hair color, those golden blonde/brown tones help make the color look more natural. The hint of brown in the Style Edit makes it look like real color that could have grown out of my head. I’m obsessed. It’s still slightly darker than my color, but I keep it close to the roots so it looks more natural and like a shadow. Look at someone who has their natural hair color and watch them turn their head (I know this sounds very creeper-ville), but often on natural hair the hair closest to the scalp seems slightly darker than the rest of the hair. The Style Edit doesn’t flake or budge one bit. I’ve done workout classes where the sweat is dripping off my face onto the floor and this stuff does not move. It only comes off when I put shampoo on it in the shower, then it rinses out completely. It sort of looks like when you wash your hair for the first time after coloring, the water is slightly reddish then goes clear. But it doesn’t budge on clothes or pillow cases at all. I’ve scratched my head a few times and then it will come off where you scratch it, so I have to remind myself to keep my grubby mitts out of my head, which a grown woman probably shouldn’t have to remind herself of. The texture is also amazing. It’s not tacky or sticky at all. You can feel there is something there, but it feels more like a light texture spray or dry shampoo which you can run your hands through. It’s the best formula. It also comes in Blonde, Lightest Brown, Medium Brown, and Black. The price also rocks. I paid $19 for it (2 oz can) at the beauty supply store, but then found it on Amazon for $12 a can. I sometimes hesitate to buy beauty products off of Amazon, (never buy a beauty blender or Naked palette from Amazon) because there are a lot of fake makeup products being sold as real. Which is completely bizarre, but again, I’m getting off topic. So I ordered a can just to test and make sure it’s authentic, and it is. Success! I’ve also ordered brushes from Makeup Geek and B Dellium, both of which have been authentic. I think hair products and brushes tend to be less copied than the “must have” hot new palette that these shady weirdos will sell fakes of. So long story short, Style Edit might be harder to find in stores, but you can buy the real deal on Amazon and it’s also super cheap. And now for one of my most favorite things in the entire world: before and after photos. Root touch up sprays are heaven sent! I love grey hair, but you have to go full grey, or else you def look balding as you can see in the “before” shots. The thin nozzle makes it super easy to control placement. I’m SO, SO glad and grateful I found this stuff! I have not gone without a can since I found it about 2 months ago. I’m still on my first can, but have that Amazon order in my closet for when the first can runs out. 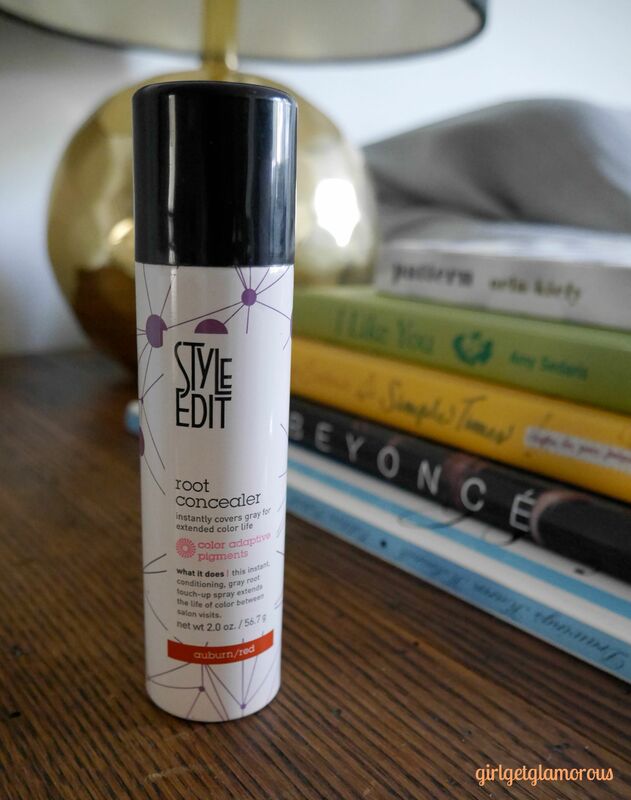 Style Edit looks and feel so natural and is a great price. Such a win-win! I hope this post helps if you color your hair like me and need a solution in between colorings. Please feel free to share it on Facebook or Pin any of the photos to Pinterest by hovering about the photo until the “Pin It” button appears. Thank you for reading and being a part of the blog! DHC Skincare Favorites and Giveaway!